Here's a visitor that we had a week or so ago - a female Prairie Falcon. ...and here's the Prairie Falcon range map (adapted from this site). Like the Northern Goshawk, the Prairie Falcon predominantly hunts birds. It was was likely attracted by the large number of pigeons that we have hanging around. I'm particularly fond of the draped polygon! The image above illustrates absolute population growth for Colorado counties between 1990 and 2000. That's why Mercator uses that ln[tan[pi/4 + phi/2]) factor - and it still stretches the crap out of the high latitudes (and can't make it all the way to the poles)! Looking at their range, it becomes clear where the "Northern" part of the name comes from. The map below is adapted from one I found on a US Fish and Wildlife site. We typically see the Accipiters during Fall and Spring, when they're migrating. We were involved in a ridgeline protection project back in 1998 for the Town of Castle Rock, Colorado. This project was an early application of our skyline mapping algorithm, which delineates areas of the landscape where structures would break the skyline. Here's a link to the ordinance that was approved at the end of the project; and here's the final map with legend. The image below shows a birds eye view of the skyline map. We've gotten a chance to revisit this work with a new project in the area. It's been very rewarding to find that - with the new tools available 12 years later - that the original mapping is holding up very well. I may be biased, but I think the Town has one of the most defensible ridgeline protection zones around. We've done a lot of work in beautiful SW Colorado (for Alpine Loop examples see here, here, here and here). The area has drop-dead gorgeous scenery, fascinating American Indian and mining history and unbeatable outdoor recreation. Perhaps the greatest jewel in the region is the All-American San Juan Skyway - a scenic and historic byway that traverses an incredible landscape from desert to high mountains. 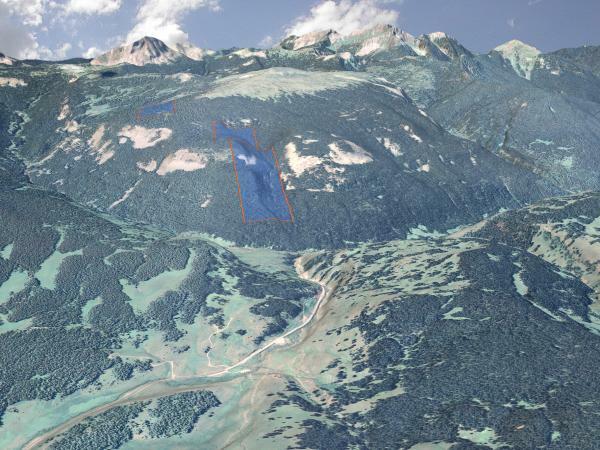 With a little luck, these high mountain properties will soon be publicly accessible US Forest Service lands! Congrats to TPL on this and many other successes in the San Juan Skyway area. I stumbled upon this image I created a couple of years ago from some LiDAR data. I was generating a DEM from the LiDAR points - and I guess I was bored. Instead of generating a "point cloud" image, I made a "sphere cloud" image where each (xyz) triple was a sphere center (I don't remember what I used as a radius.) Click on the image below to get the high res version. 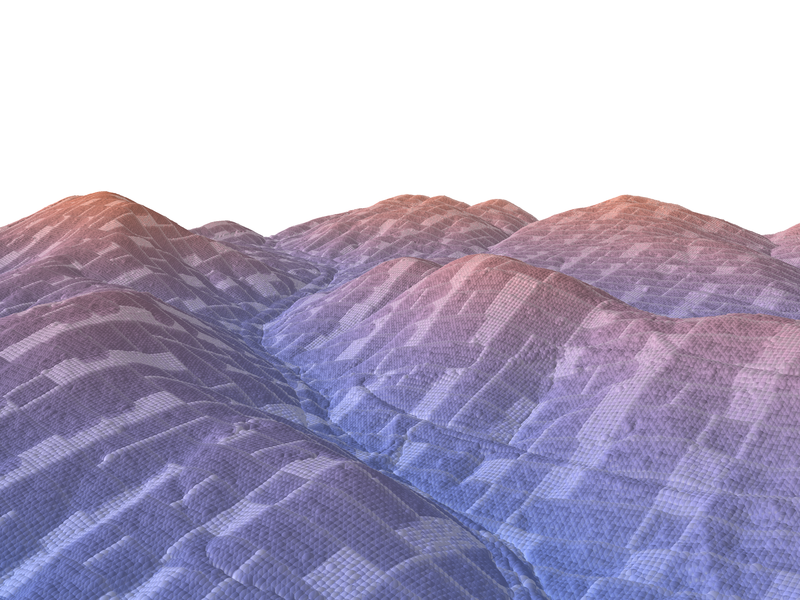 It looks like I also did some elevation-based color scheme: blue hues down low with red increasing with altitude. Gives it a cold feeling in the foreground valley and an alpenglow feel in the back. I think the weird color pattern is due to point density. We're submitting a proposal for a "pitch" at the Jackson Hole Wildlife Film Festival Symposium coming up October 26-28. Our pitch is for fimmakers to enhance their offerings with the geo-animation service, quickly orienting viewers to places and concepts. Here's a 3-minute video "Geo-Animation: Animating Places and Processes"
Hope you enjoy..and hope to see you there! We've been working for a number of years with the great folks at Commonweal Conservancy on a conservation development project at the 13,500-acre Galisteo Basin Preserve south of Sante Fe, NM. Commonweal's goal is to focus the development in a small portion of the property and preserve approximately 13,000 acres as open space. They've spent a lot of time, money and effort determining the best locations for development and they've made sustainability the driving consideration. Here's an overview showing the property with a viewshed map overlaid. From a technical standpoint this has an interesting feature. We've defined a primitive in our 3d program for a "draped image-filled polygon." So rather than trying to build the transparent viewshed map into all the image tiles prior to rendering, it's a simple matter of specifying the image and clipping polygon - something really quick and easy. We've recently started a mapping project for Larimer County Natural Areas. Although the end result will be a hard copy open space / trail map, we also did a "trail trace" animation of the popular 13-mile Blue Sky Trail. This trail runs from Highway 34 west of Loveland to the west side of Horsetooth Reservoir. Larimer County and the City of Fort Collins have done an outstanding job of conserving a variety of natural areas while providing recreational access to residents and visitors. We often use 3d visualization to highlight specific landforms like ridgelines. When you view along the ridge axis, you can use lighting that's roughly perpendicular to the ridge axis to highlight. In this way, one side of the ridge is illuminated while the other is shaded. It's more difficult to bring out a ridge when you're viewing a face straight on (perpendicular to the ridge axis). The whole face is usually either illuminated or shaded and it's hard to distinguish it from background landscape elements. In the image above, I'd like to highlight the ridge in the center. Right now it blends in with the background terrain and is difficult to see.